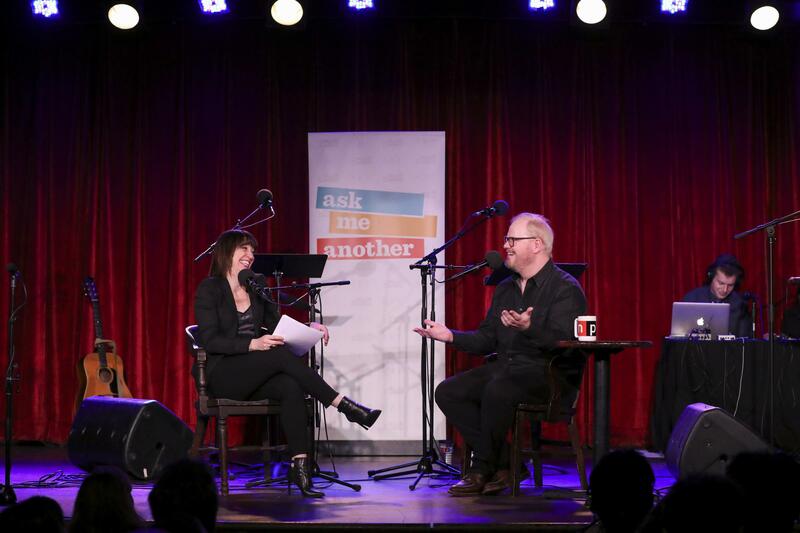 Host Ophira Eisenberg chats with comedian Jim Gaffigan on Ask Me Another at the Bell House in Brooklyn, New York. How has comedian and actor Jim Gaffigan's relationship with his wife Jeannie evolved over their 15 years of marriage? "I've become more and more frightened of her," Gaffigan deadpanned to Ophira Eisenberg, host of NPR's Ask Me Another at the Bell House in Brooklyn, New York. "I was very resistant to [collaborating], but now it's full-on codependency." The husband and wife creative duo have worked together for their entire career — from stand-up material to a semi-autobiographical TV Land series The Jim Gaffigan Show, which depicted their family life and living in a cramped New York City apartment with five children. Currently, Jeannie is directing and executive producing Jim's next stand-up special, titled Quality Time, which is intended to be the first original comedy special for Amazon. "When we were first dating we'd get a bottle of wine, we'd sit back, we'd write," Gaffigan recalled. "Now that doesn't happen. Now she sends me emails of comments when she sees a show. And sometimes I'll read them. Her insight is invaluable." Since his previous appearance on Ask Me Another in 2015, Gaffigan has seen both a career high and personal low. In late 2015, Gaffigan had the opportunity to open for Pope Francis at the Festival of Families in Philadelphia for an audience of over 1 million people. At first, the comedian thought the joke was on him. "I thought, 'Okay, they're gonna come and they're gonna see this is not a good idea. This guy talks about bologna for 10 minutes,'" Gaffigan reflected, "'And then the religious leader of the world of Catholics will come on.'" Going into the performance, Gaffigan understood that he would never amass universally positive feedback. "There are certain situations that you're not going to succeed in. There's no scenario where a comedian's opening for the Pope and people are like, 'That's what we wanted,'" Gaffigan joked. "'You know what, I like the Pope, but the guy that went on before was better.'" Jim Gaffigan returns to Ask Me Another at the Bell House in Brooklyn, New York. Two years later, the comedian faced another, more personal challenge: His wife Jeannie discovered she had a pear-sized brain tumor. Despite the intensity of Jeannie's health scare, Gaffigan felt compelled to include jokes about the experience in his Grammy-nominated 2018 album, Noble Ape, after consulting with her. "[Jeannie] came out of that and she was like, 'I do want people to know that they can go through this and survive,' because immediately when she found out she was on the internet looking for examples of people who made it through brain tumors." They also found that this material resonated with audiences who have feared for a loved one's health or spent weeks in a hospital. 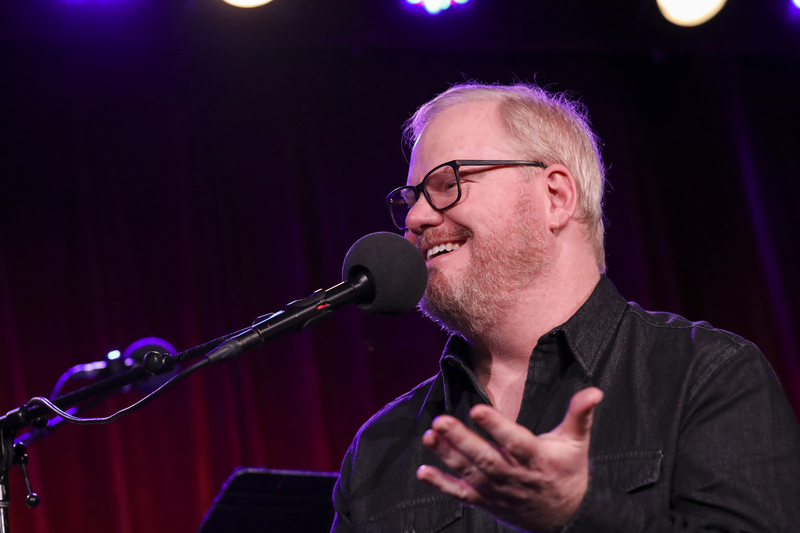 "I'll run into people in airports, and they'll say, 'I prayed for your wife,'"Gaffigan said. "It's strange because you don't realize how we're all connected. And that's why I'm running for President," he joked. Between the release of his Noble Ape and his forthcoming Amazon special, Gaffigan starred in three films that played at the Sundance Film Festival: Light from Light, Them That Follow, and Troop Zero. "I've always done acting, I've just never gotten roles," Gaffigan said. "People will ask, 'Why this shift into dramatic roles?'" Gaffigan said, explaining "Because now they started to hire me." Plus, each character allowed him to showcase new sides of himself: "Different roles and different lengths of beard," Gaffigan explained. "There's a lot of beard acting." In Troop Zero, Gaffigan plays Ramsey Flint, the father of a young girl who dreams being included on NASA's 1977 Voyager Golden Record. For his Ask Me Another challenge, Gaffigan had to guess whether a sound or image described was featured on the actual Voyager Record. "The aliens would be like, 'What kind of weird people eat both sides. They eat a bite of the hot dog and switch to other side? Save the best bite for last.' No wonder the aliens haven't come. These people are annoying." "The whole Acela line from D.C. to Boston — I call it the corridor of hate. It's not necessarily violence, but it's pretty close to it. You go to Virginia, people are thoughtful and introspective. Baltimore, no." JONATHAN COULTON: This is ASK ME ANOTHER, NPR's hour of puzzles, word games and trivia. I'm Jonathan Coulton. Now here is your host, Ophira Eisenberg. Thanks, Jonathan. It's time to welcome our special guest. He's a comedian, actor, writer, and his last comedy album, "Noble Ape," was nominated for a Grammy Award. Please welcome Jim Gaffigan. JIM GAFFIGAN: Thank you. Thank you so much. EISENBERG: ...With your wife, Jeannie. EISENBERG: And you - a lot of things have changed for you because you've done so many things in that time (laughter), including that you are going to record the very first comedy special for Amazon coming up. GAFFIGAN: I am. I am. GAFFIGAN: See how much - yes. EISENBERG: And your wife, Jeannie, is directing and executive producing your special. EISENBERG: So you guys have worked together through your entire career and relationship. EISENBERG: How has it evolved over the years? GAFFIGAN: I've become more and more frightened of her. GAFFIGAN: Well, it's shifted so much because, you know, we've been married for 15 years. I think it's 18 years we've been together, and the relationship has changed. You know, you're a comedian. Initially, you know, when people pitch you ideas, you're, like, very polite. You're like, that's neat. Thank you for that. That's not at all what I'm doing. So I was very resistant to it. But now it's full-on co-dependency, I would say. GAFFIGAN: But it changes. You know, it's the availability of - you know, when we were first dating, we'd get a bottle of wine. We'd sit back, and we'd write. It's like now that doesn't happen. Now she sends me emails of, like, comments when she sees a show. And sometimes I read them, you know? GAFFIGAN: She doesn't listen to the radio anyway. EISENBERG: ...At the Festival of Families in Philadelphia. How does that call or email come in? GAFFIGAN: Well, it - my manager was called, and I thought it was a joke. GAFFIGAN: So, like, I thought that time was going to pass, and they were going to be like, well, obviously we're not going to have a comedian perform before the pope goes on. GAFFIGAN: And then, at one point, I had shows in Atlantic City, and all the organizers were from Philly. And they came. And I'm like, all right, they're going to come, and they're going to see this is not a good idea. EISENBERG: It's also so funny that they're scouting you in Atlantic City. GAFFIGAN: (Laughter) And then, like, the religious leader of the world of Catholics will come on. It was - but it was fascinating because it's also - you know, as a comedian, you know this. There are certain situations that you're not going to succeed in. You're just not - there's no scenario where a comedian's opening for the pope, and people are like, that's what we wanted. You know what I mean? GAFFIGAN: You know what I mean? Like, there's no scenario where people are like, you know what? I like the pope, but the guy that went on before was better. You know what I mean? GAFFIGAN: And I was in Philadelphia, which they just generally just like to eat people. GAFFIGAN: So it was - but I knew that going into it. It made me realize that the northeastern part of the United States is why this - we're this country that's independent of the - of England, is because there are people in the Northeast that just like to fight. GAFFIGAN: Right? I mean, that is just the whole Acela line from D.C. to Boston. I call it the corridor of hate. GAFFIGAN: It's just - it's not necessarily violence, but pretty close to it, you know? But you go to Virginia, people are kind of thoughtful, introspective. Baltimore? No. EISENBERG: So in your latest comedy album, "Noble Ape" - congratulations on the Grammy nomination, by the way. GAFFIGAN: Thank you. Thank you. EISENBERG: Worthy of the nomination, of course, and the material is very autobiographical, including - you go pretty deep because you talk about your wife's dealing with a brain tumor she had. EISENBERG: She had it removed. GAFFIGAN: You don't get to keep it. EISENBERG: You don't get to - they don't give it back to you. Here you go. But I'm sure that was a very traumatic thing that happened in your lives. EISENBERG: And you know, when you're doing material like that, that is so intense and personal, and your wife is involved with your comedy, how did that come together where you both agreed that this was worthy to talk about on stage? GAFFIGAN: I was not of the opinion - I was like, I don't want to bring this up. GAFFIGAN: I mean, some of it is I'm superstitious. And you know, she had this brain tumor the size of a pear removed from her head, and she was - like, one of the things - she came out of that, and she was like, I do want people to know that they can go through this and survive because immediately when she found out, she was on the Internet looking for examples of people making it through brain tumors. So that propelled her to encourage us to kind of do some material on it. And also, some of it is, as comedians - and you know this - it's like, how you deal with situations is to write jokes about them. And what I found was so fascinating - is, you know, maybe someone doesn't have a spouse that's had a brain tumor, but everyone has spent those two weeks in a hospital. So when I started doing the material, it was very - it was amazing how it connected with people. EISENBERG: ...Like, that disconnect and connect. GAFFIGAN: You know, we live in such a connected age. You know, it almost was weird if I didn't bring it up. GAFFIGAN: You know, I had to bring it up at the beginning of the show because if I didn't, people would be like, is he going to talk about the fact his wife had a brain tumor? EISENBERG: Right. It would be the elephant in the room. GAFFIGAN: So - yes. So it was pretty fascinating. You know, I'll run into people in airports. And they'll be like, you know, I prayed for your wife. And I'm like, well, thank you, you know? But it's strange 'cause you don't realize how we're all connected. And that's why I'm running for president. GAFFIGAN: That's right - free college tuition. EISENBERG: And now you have three films that are coming out. EISENBERG: You were just at Sundance. They had their world premiere. The roles are pretty meaty, dramatic roles. GAFFIGAN: Yeah - so fun. EISENBERG: So yeah. This is so fun. GAFFIGAN: It is. It's amazing. I mean, I've always done acting. I just have never gotten roles, you know? GAFFIGAN: So it's - people will ask - they're like, so why this shift into these dramatic roles? I'm like, 'cause now they started to hire me. GAFFIGAN: So it's - they're different roles, and they're different lengths of beard and all of that. GAFFIGAN: There's a lot of beard acting. No, but they're - like, you see - you do things, and you forget. But my beard in "Them That Follow" was out to here. Like, it's pretty impressive. EISENBERG: ...ASK ME ANOTHER game? All right. EISENBERG: So Jim, we were inspired by one of your three movies at Sundance - "Troop Zero" - 'cause you play the dad of a girl who dreams of having her voice recorded for the Golden Voyager Record. NASA launched the Voyager record into space in 1977, and it contained music and sound and images meant to depict life on Earth. So I'm going to describe something, and you're going to tell me - is it really on the Voyager record, or did we just make it up? And if you do well enough, listener Kelly Degaring (ph) from Arvada, Colo., will win an ASK ME ANOTHER Rubik's cube. All right. A photo of a man biting into a sandwich that already has a bite taken out of the opposite side and a woman licking an ice cream cone - is that on the Voyager record? GAFFIGAN: I thought it was all audio. GAFFIGAN: I'm going to say no. Yeah. GAFFIGAN: I'm going to say no. EISENBERG: It is on it. GAFFIGAN: I knew it. I knew it. EISENBERG: It's to demonstrate eating. GAFFIGAN: Oh. There you go. EISENBERG: Yeah. I like that it's, like, a guy eating a sandwich and a woman licking an ice cream cone. GAFFIGAN: Why was there a bite on the other side of it? GAFFIGAN: The aliens are going to be like, what kind of weird people eat both sides? It's like, they eat a bite of the hotdog, and then they switch to the other side. GAFFIGAN: Save the best bite for last. GAFFIGAN: No wonder the aliens haven't come. They're like, oh, these people are annoying. EISENBERG: In case aliens want to know what kind of sound keeps us up at night, there's an eight-second clip of a faucet dripping. Is that on the Voyager record? EISENBERG: You're correct. It is not. It is not. EISENBERG: If aliens ever land here and need to tell the difference between a wild dog and a domesticated dog - good news - recordings of both are included. Is that on the Voyager record? GAFFIGAN: That could be on there, but, like, I don't know if - like, what - how do you know a wild dog versus a domesticated dog? Like, one dog's like, I live in a house (imitating barking). GAFFIGAN: You know what I mean? (Imitating barking) I live outside. I'm not domesticated. Don't they bark the same either way? EISENBERG: I do think the domesticated dog sounds relaxed. GAFFIGAN: They're like (imitating barking). GAFFIGAN: There's at least going to be a bowl of water. EISENBERG: So what do you think? Is it on the record? GAFFIGAN: Sure. Why not (laughter)? EISENBERG: Yeah, you're right. It is. It is on the record. EISENBERG: All right. This is your last clue - a photo of a woman in a fruit aisle of the supermarket guiltily staring at the camera while eating a single grape. GAFFIGAN: Guiltily - I didn't even know that was a word. EISENBERG: We'll find out from our listeners if it's not. GAFFIGAN: Why is she guiltily eating a grape? Oh, because she's eating it in the grocery store. EISENBERG: I guess so, yeah. GAFFIGAN: I think it's - I - yeah. No. Yes. I'm good at this. EISENBERG: It is on the album. You're right. GAFFIGAN: How did I know? GAFFIGAN: You know, what's amazing is I didn't hesitate. I just answered. EISENBERG: I know. You're decisive like that. Congratulations, Jim. You and Kelly Degaring won ASK ME ANOTHER Rubik's cube. EISENBERG: Jim will be joining us for another game later in the show. Jim Gaffigan, everybody.